I knew having a baby was going to be a lot of work, but I had no idea it was going to be that much work. Around here, the first few weeks were extremely difficult as my husband and I had to deal with a newborn that wasn't nursing well, sleepless nights that turned into exhaustive days, and my own recovery from Big Sister E's 28-hour marathon labor in which we discovered that my 5'4" body wasn't really meant to give birth to a 10 pound, 5 ounce baby. Needless to say, we were tired. Very tired. So, keeping track of when and how much our infant was or was not eating, when she had last had what type of diaper and how long she had slept was something that I obsessively wanted to keep up with (particularly so I could answer our lactation consultant and pediatrician's questions)... but there seemed to be only so much that we could do. As a chart-making person at heart, I had a designated notebook to mark things down but that only happened if my husband or I remembered to do it... not to mention remembered where we had last left the notebook. Ugh. 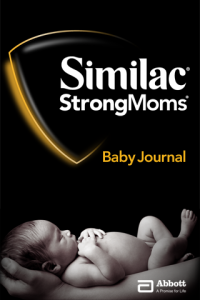 Fortunately, for moms these days there is a much easier and more convenient way with the Similac Baby Journal app for the iPhone or iPod touch. 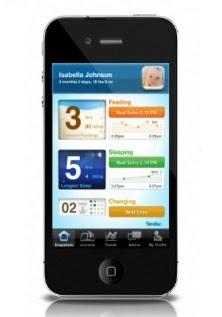 Available for free from iTunes, this app is the ultimate in terms of covering everything you need to know with a newborn and helps make sense of your baby's feeding, sleeping and changing needs. Right away, you are able to input information for you and your baby to personalize your Baby Journal just for you. 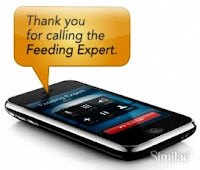 For feedings, you can quickly and easily track how much and how long your baby eats no matter if you breastfeed or bottle feed. I love the smart functionality that gives you so much more than just the time of day, but the actual start time and amount fed either in ounces taken from a bottle or, for nursing, which side to start on (something that new moms are forever trying to keep track of). One feature that I especially like is that you can take your feeding journal entries and view them in a graph format to see trends, therefore helping to predict an accurate feeding schedule. I can remember constantly counting back from the last time Big Sister E had eaten to figure out when she might be hungry next so that I would have some idea in terms of where we might be - this would have been much more helpful! Also, as we did experience quite a few difficulties with nursing, I think it's great that Similac has included the ability to not only email your journal entries directly to your pediatrician, but with the touch of a button you can be instantly connected with a Similac live Feeding Expert for help. I have a feeling I would have been turning to that button to answer the thousands of questions that were continuously floating through my head in those never-ending early days! As well as eating, another baby topic that moms are continuously fretting over is the dirty diaper. The form that I took home from the hospital with both of my girls had little circles to cross off for the different types of diapers and when they occurred throughout the day... which was also helpful as long as we managed to actually keep track. Instead, this app makes it so that you can quickly input exactly which type of diaper your baby had so that there is never any wonder how long it has been. Finally, I think that being able to track your baby's sleeping patterns during the night and day makes it much easier to know just how much snoozing time your little one is or isn't getting rather than the "Um... I think she napped for an hour or two this morning sometime..." method that I always seemed to use. 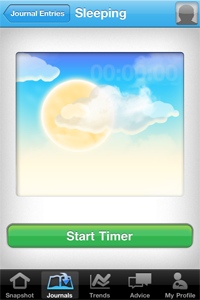 Simply start and stop the timer and all of the guesswork will be taken out! All in all, I think that this is a great app for any new parent to utilize. It is easy to navigate, very user-friendly, can be used for one or multiple babies and there is even an area for tips and advice from other moms and dads out there that know what you're going through. Considering that this app is free, it's an easy winner as a resource for keeping track of all of your baby's important growth measurements and can really work to help find a schedule that makes sense for both of you. Simply pull it up on your iPhone or iPod touch and all of your information is right there at a glance. It's just that convenient! For more information, an overview or to download the app (did I mention it's free? Well, it is!) visit Similac today. For some odd reason this app isn't available on iTunes Canada. I have always used Similac for my kids. Tried other brands, but never felt okay, so we always went back. Holy smokes. I can't believe how high-tech nursing has become. Too bad it's so stressful. I nursed my daughters until they could drink from a cup. I didn't have a bottle in the house and I didn't worry if I started on the same side two feedings in a row. I didn't worry how much they were getting, I figured it was "enough". I had two mottos: "when in doubt, whip it out" and "animals don't worry about it, why should I? ".